Megamania-pc is the remake of the old Activision game “Megamania”, for the Atari VCS 2600. 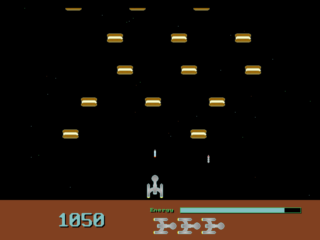 In the game you’re the captain of a spaceship fleet. While sleeping, you have a nightmare. You dream about lots of strange objects (hamburger, oreo, biscuits, tires, dices…) that attack your fleet. So shoot everything that moves, and dodge.